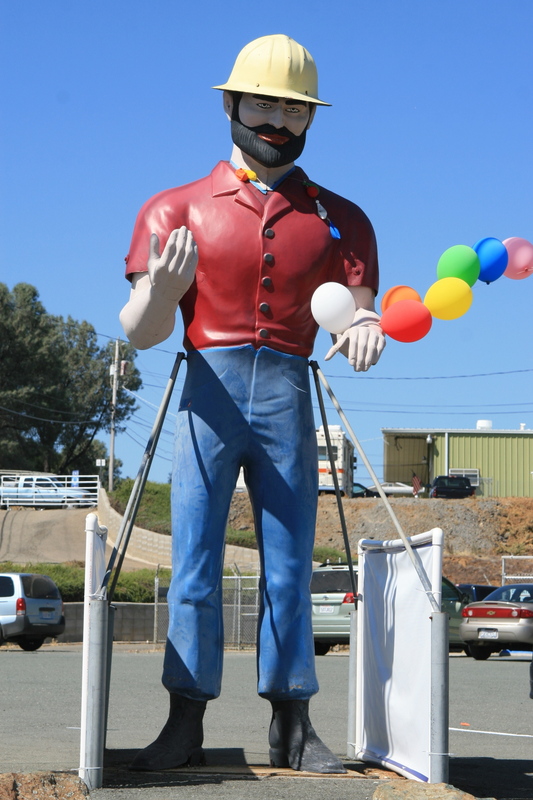 Because they are rare it is always nice to come upon one of the 15 ft versions of muffler men. 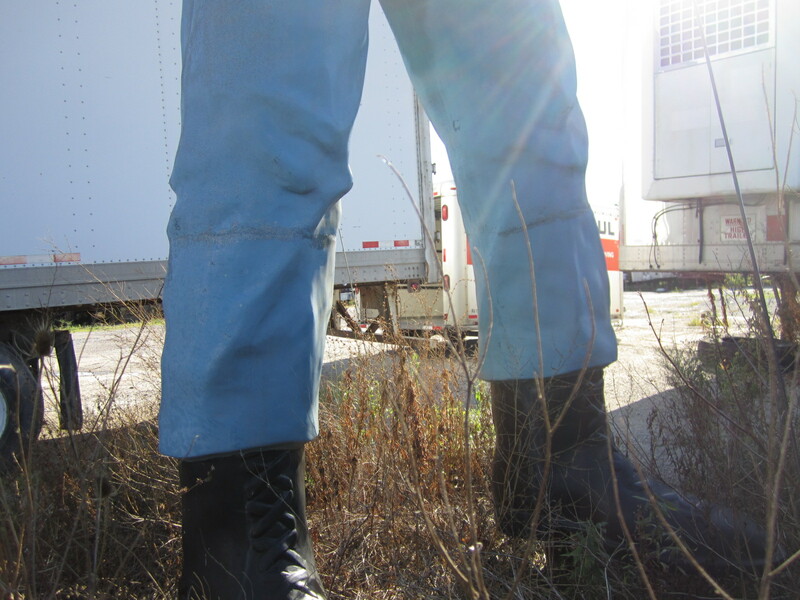 As I mentioned in AG Episode #1 after a few years of turning out the full size version of muffler men with great success, Steve Dashew owner of International Fiberglass wanted to offer customers more. He came up with the idea to make these shorter and lighter lumberjack versions in hopes of getting those customers that were put off by size or price when considering the 21 ft full size versions. They started making these guys around 1965 but unfortunately they were not all that popular and they stopped making them within a few years. They sold at least 20 of these guys however and many of them can still be found all across the 48 states today. The history of this one here at Lambs farm in Libertyville is a bit hazy but as far as I can tell he has been here since the mid or late 60’s and probably was ordered right from International Fiberglass. The story behind that started in 1961 when Bob Terese and Corinne Owen opened a pet store on Chicago’s State Street with 12 employees, the difference was that their employees all had developmental disabilities. Bob and Corinne’s mission was to help people with developmental disabilities lead productive and happy lives. 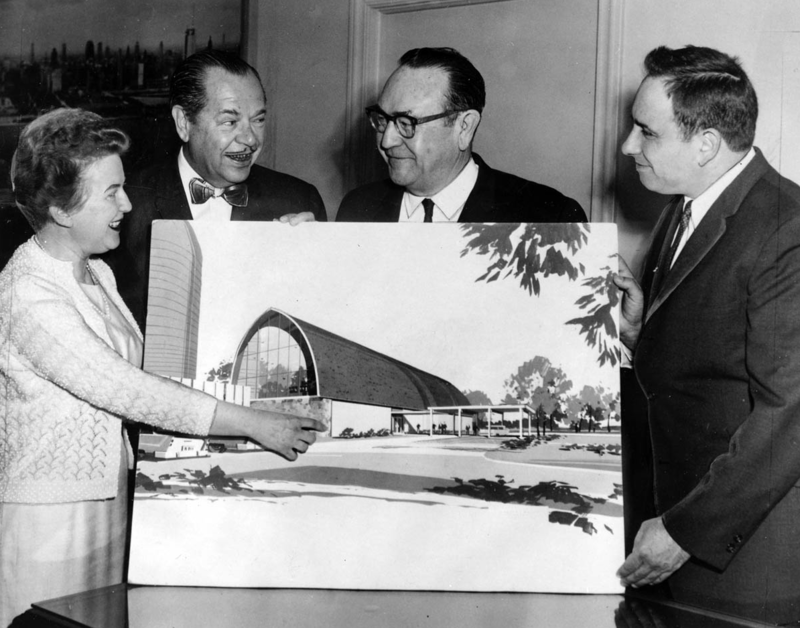 They quickly received support and growing recognition from the Chicago community and in 1965 they relocated 35 miles to the north near Libertyville where Philanthropist W. Clement Stone had purchased and donated a 70 acre farm. They restored the century old bard into the area’s largest pet stores and with the extra space they made new businesses to bring in more adults with disabilities into their program. Today Lambs Farm makes a difference in the lives of 250 participants and thousands of visitors stop by every year. 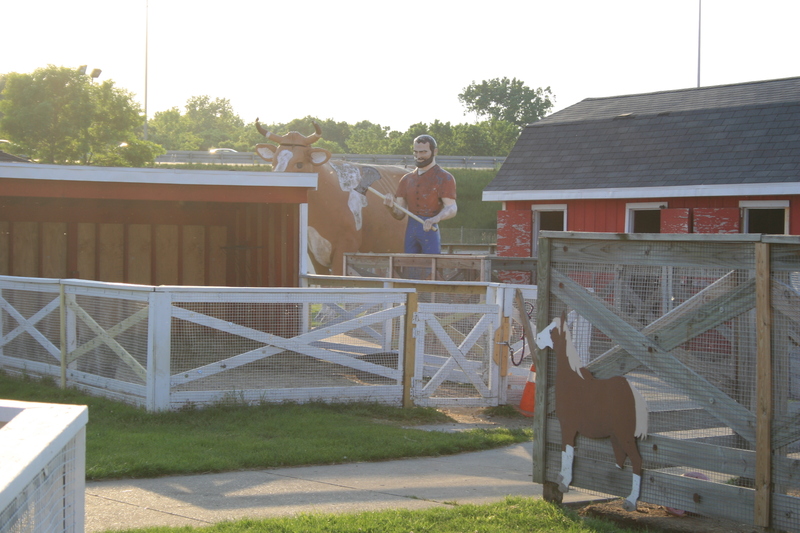 The area where the Bunyan/lumberjack stands is part of a children’s attraction that is right next to the interstate and has a petting zoo, train, mini golf, snack shops and even a restaurant. All these contribute and support the programs run by Lambs Farm. 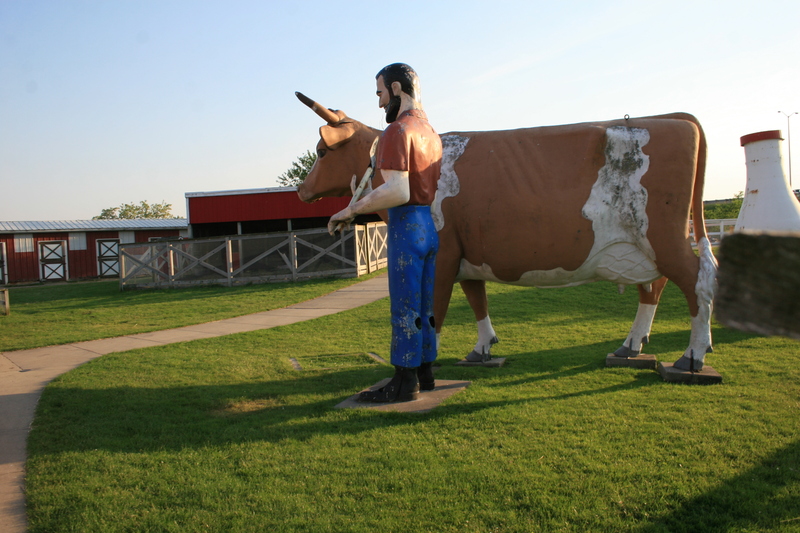 The muffler man was probably ordered early on to stand in the park and today he stands next to a huge cow and milk bottle and they all are starting to show their age. It is also possible that the bunyan was purchased later in the 70’s or 80’s and brought to the farm but not even management at the park could remember exactly when he got there or how they obtained him. We got there after the park had closed for the day but did some quick filming for a upcoming Episode and got a few pictures of the worn lumberjack through the fence. After all these years he has managed to keep a firm grip on his trusty axe. Thanks to Lambs Farm for speaking with me and letting me use content from their website. 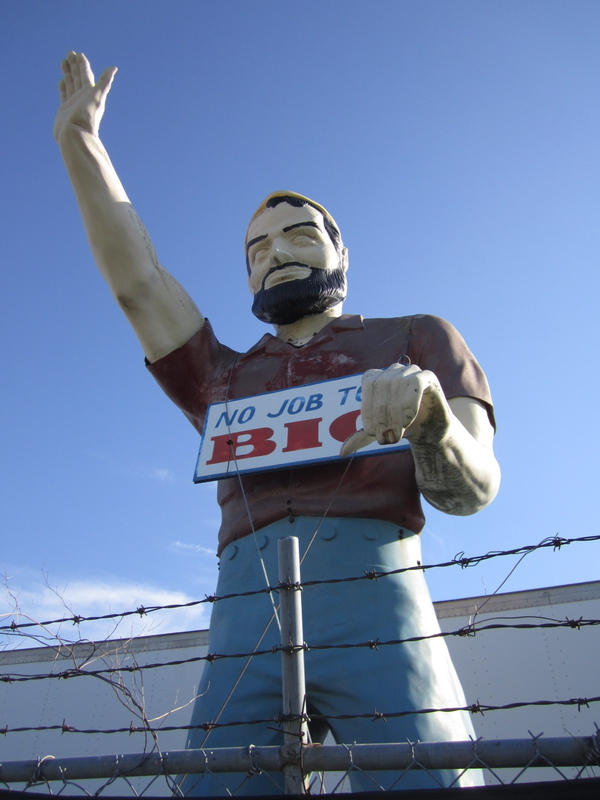 This unique bunyan version stands to the west of St Louis at Skyline Motors along I-70 and holds a big sign that says “No Job to Big”. He is a classic bunyan except he has the arm pose of an indian m man. In my two years of muffler man hunting and research he is the only one like this that I know of with a raised right hand salute like a standard indian would have. Back in the 60’s when companies purchased muffler men there were different options they could choose from and IF would combine different versions of their muffler men to meet the purchasers needs. 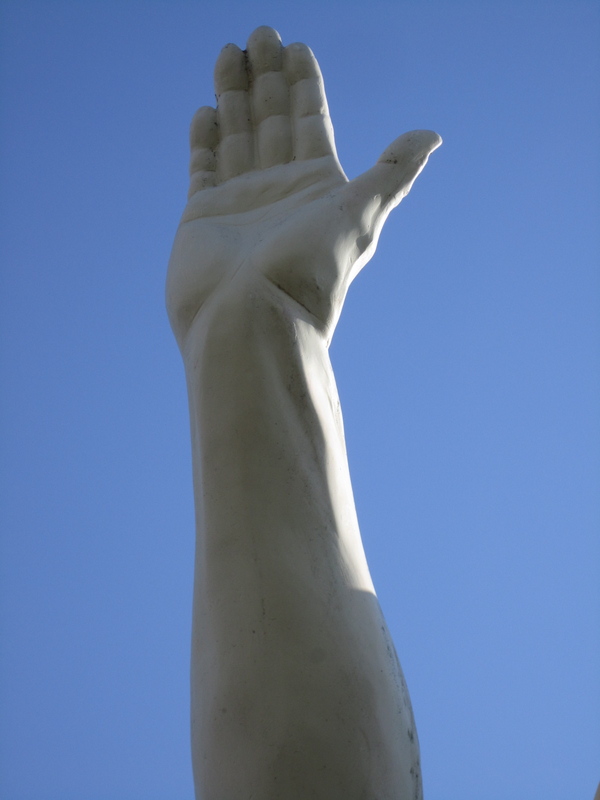 So in this rare case someone wanted a bunyan with a salute instead of the standard palm up/palm down. There is a half wit in Lake of the Ozark’s also in MO that has the right hand salute as well, he is also one of a kind being the only half wit I know of with that arm configuration. There are a few bearded service man models out their with this raised hand salute but they arn’t technically bunyans since they don’t have the pants tucked into the top of the boots and in some cases a knit cap. 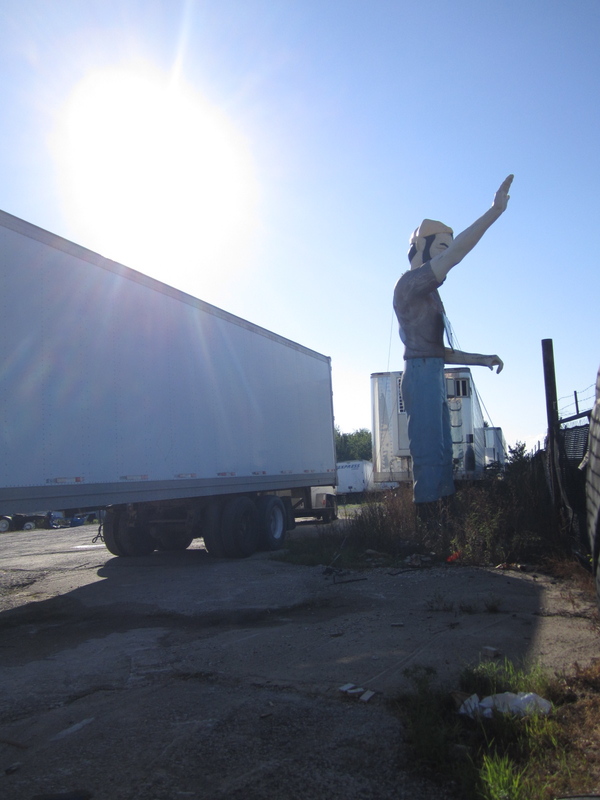 One of them stood in Vista CA for many years and is now in storage in Rocky Mount, NC along with another saluting M Man. All these versions and combinations can get a bit confusing at times and we can’t forget the Mr Bendo version which looks almost the same but has a closed fist instead of open palm and normally holds an iron bar. The history on the Foristell Bunyan is a bit hazy but it seems he once stood in front of a tire shop in St Louis during the 60’s and 70’s but was purchased sometime around 1984 and moved to the buyers property and laid on his back until 1997 when he was brought to his current location and set up behind a fence along the frontage road to the interstate. He has been here since then and badly needs a new paint job, the paint is completely gone from his eyes giving him the appearance that he has gone blind. Also again as I have mentioned in other blogs you will notice that he has cuts on his legs just below the knee. I have noticed this on many of the Bunyan versions and have yet stumble upon the reason for it. 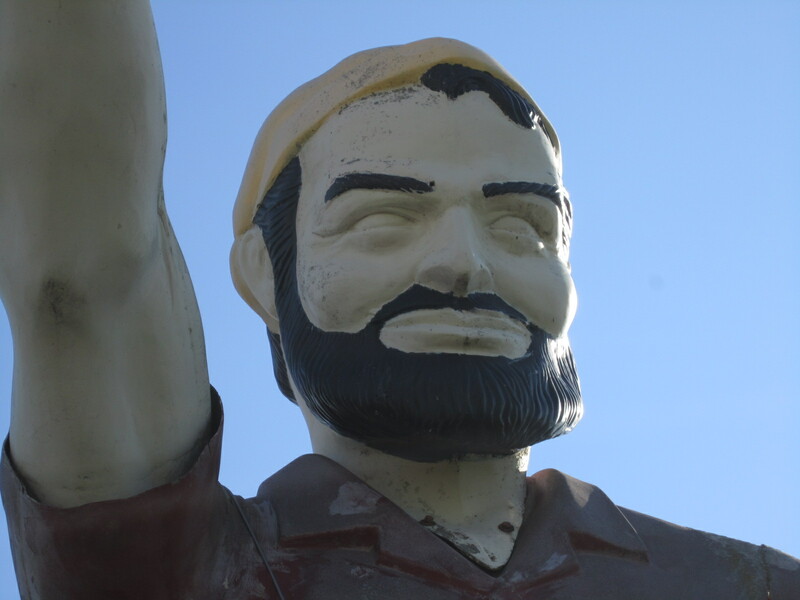 This Bunyan is part of a small group of muffler men that are in the St Louis area. 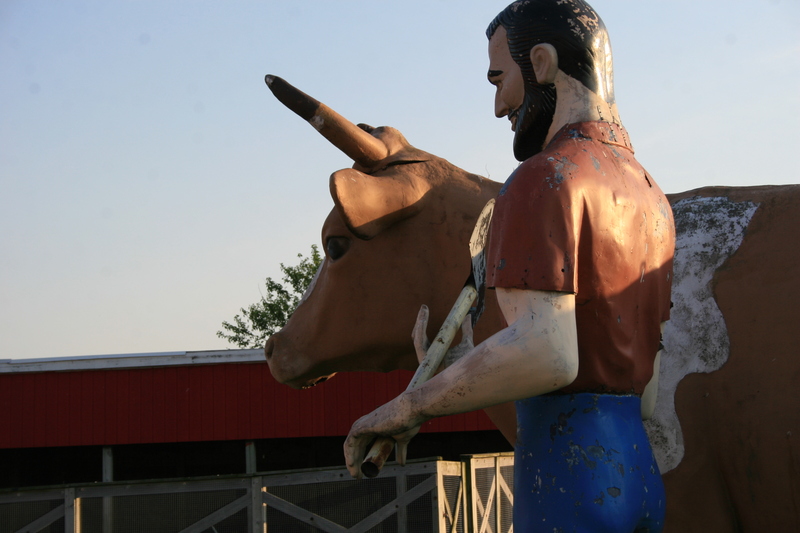 There is a cowboy to the south that has been down for a few years on his back behind a trailer business and one of the shorter Bunyan versions is to the north standing in a field along the interstate in Livingston. There also used to be a Bunyan down 44 a ways in Sullivan, MO for many years before it moved to MN and now is part of the m man collection in Rocky Mount, NC. I’ll have to do a blog on the Rocky Mount log cabin business since they seem to be collecting muffler men and have got at least 4 that I know of either in storage or at different locations in the area. Also in NC is the White Tire company who collects M Men.